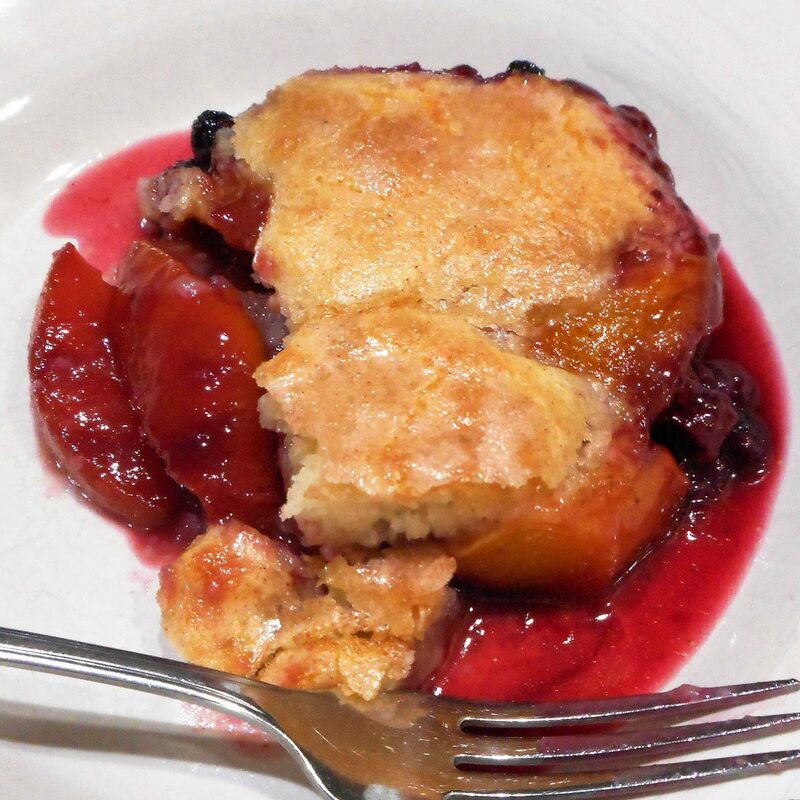 This started as a simple Grilled Peach Cobbler, but since peaches and blueberries are ripe at the same time around here, why not go for broke? Be sure your grill is well oiled or your peaches are sure to stick. No grill? Broil them, cut side up, for a couple of minutes until you get just a bit of color. For fun, add half a cup of berries to the baking dish with the peaches. 1. Preheat a well oiled grill to medium-high heat. 2. Brush the peach halves with the 1/4 cup of melted butter, reserving any unused butter for the batter. 3. Place the peaches on the grill, cut-side-down, and cook until charred. Remove the peaches to a large bowl and allow to cool slightly. 4. When cool enough to handle, slice the grilled peaches lengthwise into 1/4-inch slices. Return the sliced peaches to the bowl along with 2 1/2 Tbsp sugar and 1 Tbsp lemon juice. Let the peaches macerate for 30 minutes. 5. Lightly mist an 8 inch square baking dish with cooking spray. If using berries, sprinkle them in the bottom of the dish. Arrange the peaches across the bottom in an even layer. 6. Combine the remaining 6 Tbsp sugar, 1 1/2 Tbsp butter, milk, and flour in a medium bowl and stir into a smooth batter. Pour any unused butter over the fruit. Dollop the batter over the peaches. It’s okay if the batter doesn’t cover all the fruit, it spreads during baking. 7. To make the topping combine the cornstarch, sugar, and cinnamon together and sprinkle over the top of the batter. Drizzle the boiling water evenly over the topping. 8. 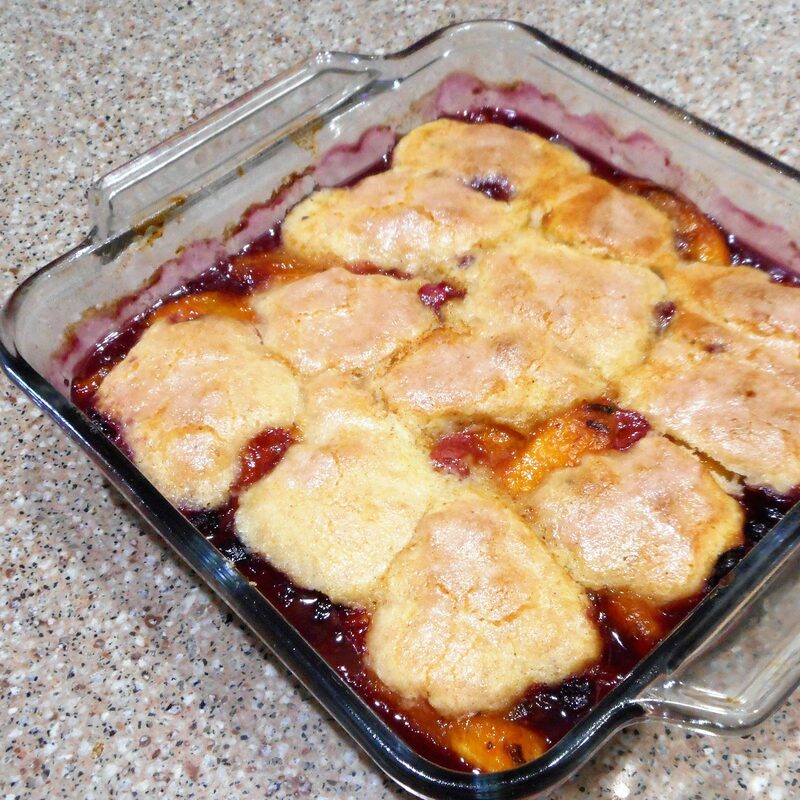 Place the cobbler on a foil lined baking sheet in the cold oven and heat to 375°. 9. Bake for 45 minutes, or until browned and bubbly. 10. Serve with a scoop of vanilla ice cream on the side.